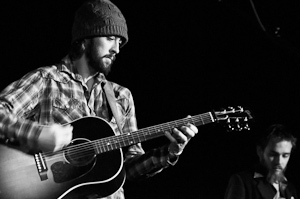 Raw and powerful — Ryan Bingham and The Dead Horses’ high energy performance rocked the small but ardent crowd at The Rave in Milwaukee. Bingham’s career has been on the rise recently with Grammy, Oscar and Golden Globe wins for his song “The Weary Kind,” which he co-wrote with T-Bone Burnett as the theme for the Jeff Bridges movie Crazy Heart. Burnett, a music industry hit maker, produced Bingham’s latest album Junky Star. Even with all of the recent success, Bingham’s current tour is still playing in relatively small venues across the country, and his music remains honest and real. Opening with “Dollar a Day,” a song for the working man from his first album Mescalito, he continued on with an energetic set comprised of songs from all three of his albums but leaning heavily on his latest album Junky Star. Ryan is a true artist and his raspy voice is a perfect conduit for his heartfelt and very personal lyrics. His music doesn’t easily fit in any one category. Influences of artists like Bob Dylan, Neil Young, Waylon Jennings, and rock greats along with traditional Mexican music can be heard in his songs. Earlier in the day, Bingham had stopped by the protest rally at the State Capital to sing in support of the unions. His first encore at The Rave was a solo performance of Guthrie’s “This Land is Your Land” to which he added a verse ending with “Try to take our unions, you’re gonna hear us holler.” The band rejoined him for his own “Southside of Heaven,” “Sunshine,” and “Bread and Water” along with a rendition of Townes Van Zandt’s “White Freightliner Blues”. Much of Bingham’s music can directly relate to the struggles union workers in this state are now facing which makes it seem to be a perfect time for him to blow into Wisconsin. In addition to Bingham, to begin the evening at The Rave, Liam Gerner, an Australian native currently working out of London, gently started the evening with his solo performance but amped it up at the end of his set with a bluesy number backed by the Dead Horses. This is his first time touring the US, but his beautiful writing and singing along with pop star good looks bode well for plenty of return visits.